This Thanksgiving was one that will go down in the books for me. After just moving to San Diego from Boston, we were able to plan a Thanksgiving Dinner for 15 people that was stylish and delicious. We got to eat outside and enjoy the sun, the breeze, the food, and the company. It took us two weeks to finalize and fully prepare what we were getting ourselves into. A full day and a half of cooking and baking that was planned down to the hour. We wanted everything to be perfect, and it certainly was. I’ve come up with some tips and tricks to help make your next Thanksgiving a little easier, and hopefully more fun. Thanksgiving can be hard and overwhelming, especially if you plan on doing everything yourself. Everything involved from planning, to cleaning, to cooking, to more planning, and to decorating, is tough and takes a whole lot of effort. Effort that is almost impossible for just one person to be able to accomplish. Breaking up the chores and to do lists and assigning tasks to family members or roommates is the best way to get things done. Usually it’s not too hard to ask for help, at least in my case, the help flooded in. Have fun with the planning and the preparation. Don’t have your heart set on one way of doing things and leave room for mistakes to happen and things to go wrong. We had planned down to the hour everything we wanted to accomplish from Wednesday night until 2 o’clock Thanksgiving Day when we planned on eating. Things took a little longer and with all of the hungry people there, the pressure was on. It’s a good idea to have things ready for when people get there. We made a small cheese plate with some crackers, as well as some Texas Caviar and chips for some protein to help satiate people’s hunger until the feast was ready. Well, the dog ate the cheese plate, and the pigs in blankets that we were planning on making were still frozen. Some things are overlooked and like I said, plan for things to go wrong. Have a backup plan and try not to go too crazy. 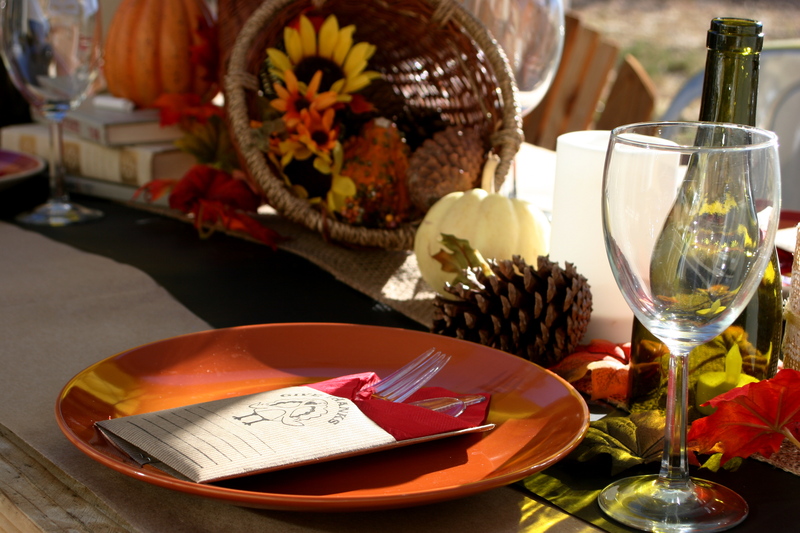 For less than $50, we were able to decorate the table outside and add a touch of home to the feast. We got items from sale sections of major stores, thrift stores, and our own backyard. A thrift store is a great place to go to find almost anything you may need from kitchenware to decorations, from clothing to fabric, and much more. I started there and got some essentials: a bundle of fake leaves for $1.99, a bag of pine cones for $.99, a bag of gourds for $2, and some fake corn for $.49. We had outdoor candles already and some faux wine bottles and books. Add a cornucopia to that and the table was complete and festive. Instead of using one of those tacky table settings, we decided to use kraft paper to cover the whole table, which we found for $4 a roll at Target, as well as chalkboard paper and a thin roll of burlap to use as the table runner (each costing $5). Look at all of your options and think outside the box before you spend too much money in one spot because I guarantee you’ll find it cheaper somewhere you would least expect. We used the remaining kraft paper to make the napkin holders. On the napkin holders, we used stamps we found on sale at Michael’s and stamped away. We bought some festive plates and some extra wine glasses at the dollar store spending about $20 there for the full place setting. We had chalk laid out along the table so people could draw on the chalkboard paper and write their name where they were sitting once they grabbed their glass or plate. Since we just made a new transition, we decided it was a good idea to start some new traditions. On each napkin holder, we had everyone write what they were thankful for. We gathered all of them and passed them around so you were reading someone else’s note. Saying thanks at the table, especially around people you don’t know that well, let’s face it, can be pretty awkward. This was a great way to make it fun and everyone had a good time with it. Most of them were similar, but sweet nonetheless. When everyone is involved in these traditions, whether you are old or new friends, it has a way of bringing people together. If you are planning on doing all of the cooking and providing all of the drinks, it is okay to have people come with something else: money. Charging people $X amount (we chose $20) is a fair and easy way for people to contribute. The most expensive things about thanksgiving are the food and liquor. That totaled us around $275. Then again, that was for 15 people, which included two 15 pound turkeys (one of them being organic and the other being free), 4 bottles of wine, a case of beer, ingredients for every dish (most of it which was purchased on sale), and everything in between. Doing a potluck can be a blessing or a curse. Not everything will be made fresh, and people most often just come with something store bought, which makes a difference. It is also nice to give people a holiday in which all they do is show up. If you have a smaller group and have the time to coordinate a menu and assign to each person, then go for it. Depending on how busy you are, that could be your best option. It’s always safe to show up with extra food for people to take leftovers, so don’t forget to double up! When preparing for the dinner itself, it helps to create a menu which includes an ingredients list, and have every recipe you are using at hand, otherwise you can easily become distracted, lose or misplace things, or forget where you left off and where you need to start next. Since we had 2 small turkeys, we put them in the oven together, but allowing for 1 hour extra to cook (half hour extra per turkey = 1 hour). When the turkeys first go in the oven, this is a good time to chop everything you will need for all of the side dishes and salad. That takes up a lot of time, which can be used to actually cooking the food, or having some down time. If you are making most of your sides in the oven, which is what we did, you can cook them with the turkeys, but allow for some extra time to cook. When you take the turkeys out, they should rest anywhere between 20-45 minutes. The longer they rest, the juicier they will be. During the resting period is when you can cook everything else you need to in the oven. We wanted everything as fresh and hot as possible, so we did most of the last minute stuff at the very last minute, such as the mashed potatoes, rolls, corn, and gravy. You can use the bones and juices from the turkey to make the gravy. Add some flour and salt and pepper and stir occasionally while it thickens. With the other leftover bones, you can make a turkey stock by boiling the bones in a big stock pot. This makes an easy solution for leftovers: turkey soup. Tastes just like chicken soup, but with turkey. Make it any way you want, it’s that easy and adjustable. For the sides, it’s easy and best to include the classics, but make sure you have a couple of vegetarian options for those people who won’t be eating turkey. There’s no need to put bacon in everything, which, although tasty, has them unable to enjoy much of anything. Once all the sides are done, throw some serving spoons in there and invite everyone to make a plate. Eat, eat some more, and enjoy the time you get to sit down and relax with family and friends. While everyone is eating is a good time to throw the pies in the oven to heat up (pies are easiest and best made the night before). Have some vanilla ice cream ready, small paper plates, and plenty of extra silverware. It’s easy to start cleaning as soon as you’re done, since you just made a huge mess while preparing all of the delicious food. Don’t do it. That’s where everyone else comes in and gives a helping hand. You just spent the last 8+ hours cooking so you deserve a break. Sit down, relax, and enjoy your pie and wine. Allow the people that help clean up some leftovers. Have some aluminum tins available so people can do just that. Buy some with or without lids, there’s always foil or ziploc bags. Once everything is wrapped up and in its place in the fridge, sink, or trash, everyone can relax and continue the night hanging out, playing games, or watching the rest of the football games that are on. Just remember that when you want to pull your hair out and scream at the top of your lungs, everyone had a good time and enjoyed amazing food that you cooked. Remember it’s supposed to be fun and rewarding, so let it be that way. Don’t take it too seriously and learn from your mistakes so that next year can be even better. I am thankful to have the ability to be thankful and to be able to give to my friends, old and new, a place to come if they have no where else to go. I am thankful for my Mom, Dad, aunts, uncles, and grandparents, who have hosted so many Thanksgivings in which I never knew how much it probably took out of them, financially and mentally. Thanks to everyone who was able to provide for someone who was unable to provide for themselves. Last but not least, thanks to everyone who made this Thanksgiving work: Erin, Mike, Matt, and Logan, this one’s for you.